Spanish Prime Minister Mariano Rajoy is expected in Brussels on Thursday as planned for a summit of EU leaders but don't be fooled: all is not well at home. 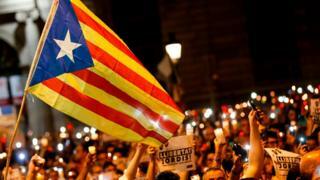 Spain is in the midst of a huge constitutional crisis. For the first time ever since the Spanish constitution was written back in 1978, a government is triggering Article 155 which can result in the suspension of autonomy of one of its regions. The article was threatened once before in the late 80s against the Canary Islands' government, which backed down immediately. In contrast, the Catalan crisis is reaching breaking point but we have to be careful here too. Nothing will happen from one day to the next. Political rhetoric aside, both the Spanish government and Catalan regional leaders know sentiments are running so high across Spain at the moment, that millions are poised to take to the streets. So what's actually going to happen now? Prime Minister Rajoy has called an emergency cabinet meeting this Saturday to decide whether to proceed with triggering Article 155 and if so, which precise measures they plan to take and in what order. They can start gently - removing the Catalan government's powers to pay public sector workers, for example. They could be more severe, such as disbanding the regional police and security forces or there is always the nuclear option of dissolving the Catalan government and parliament; giving back the reins of power to the central government in Madrid. Once the shopping list of measures has been decided, the Catalan president has the right of reply and we're told there is no limited window of opportunity for him to do so, meaning this could take days or weeks. Finally, the Spanish Senate needs to approve the measures. It would certainly do so as Mr Rajoy's party has a majority in the house. In the meantime, the Catalan parliament has warned it may well go ahead and vote to declare independence unilaterally. It has planned a meeting on Monday. As the rhetoric escalates, the Spanish government needs to consider the practicalities of implementing Article 155. What happens if the Catalan people - or at least hundreds of thousands, if not millions of them - try to block the measures on the streets? They could surround the Catalan parliament and refuse to move, for example. And if the aim of implementing Article 155 is eventually to dissolve the current Catalan government and call regional elections, is it not conceivable that large sections of the Catalan public will refuse to vote? Would the EU finally feel compelled to intervene? Imagine then the international public opinion war that would rage across social media platforms, never mind in the traditional press. Catalonia is not officially on the discussion agenda at this week's EU summit but around the water coolers, along corridors and over coffee there is sure to be heated debate. Move over Brexit. Considering the deadlock in negotiations with the UK, Catalonia is the EU's new hot topic du jour.